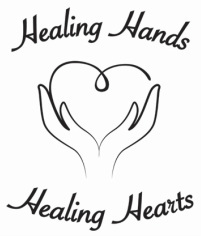 Healing Hands ~ Healing Hearts seeks to support traditional medical care by providing massage, comfort, and connection for the body, mind, and spirit of the critically, chronically and terminally ill.
For more info about upcoming classes & events, please click here. We won! Healing Hands ~ Healing Hearts is the privileged 2014 recipient of a much needed grant from The Sacramento Bee Book of Dreams Fund of the Sacramento Region Community Foundation. Read the article here. FROM THEN TO NOW... WE CARRY THE TORCH!! In October of 2010, the husband and wife team of David and Ana Dowdy, in Bakersfield, California, took over operations of the 501(c)(3) non-profit Healing Hands ~ Healing Hearts, which was originally established in Sacramento, California by Jo Williams in 2001. David and Ana knew that Jo Williams' inspiring passion to care for her aunt who was suffering from cancer brought her to recognize the incredible benefits of providing massage to people who were in hospice care. David and Ana seek to continue Jo Williams' mission, adding to it their own desire that fuels a mission to expand Healing Hands ~ Healing Hearts into a nationwide, if not a worldwide, organization. The Healing Hands ~ Healing Hearts team of therapists work with a clientele facing chronic, critical, and terminal conditions. The core goal is to help bring relief from the pain, isolation, anxiety, and despair suffered by a very special population of people among us, bringing a more human connection into their lives by offering many levels of healing to the body, mind, and spirit, in order to restore a client's hope, joy, and dignity. Healing Hands ~ Healing Hearts has been focusing on teaching certification classes in "Touch Therapy for the Terminally Ill," not only to massage therapists, certified nursing aides, and energy workers, but also to any anyone who has the desire to learn a wonderfully proven way to connect with someone using their God-given gift of touch. Healing Hands ~ Healing Hearts utilizes certified therapists as subcontractors to visit our clients in their home or any medical, convalescent, or care giving facility. We currently cover the Sacramento and Kern County areas of California. Our goal is to open branches of our non-profit all across the United States and eventually around the world. Touch: the Universal Form of Communication.